First Round : Bruce Lietzke and Bobby Walzel, at five-under-par, led by one over Ray Floyd. Second Round : Peter Jacobsen, Miller Barber, Ed Fiori and Don Pooley were tied at six-under 138, while John Fought, John Mahaffey, Hubert Green and Lietzke were at 139. Third Round : Bob Gilder was alone at seven-under 209. Barber, Pooley, David Graham and Tom Watson were one back. Cut Notes: 75 players (72 pros, 3 amateurs) at six-over par 150. Missed Cut: Tom Aaron (84-82-MC), Andy Bean (76-82-MC), Mike Brannan (77-83-MC), Bob Byman (81-77-MC), Bill Casper (82-76-MC), Charles Coody (77-83-MC), Ben Crenshaw (76-82-MC), Dave Eichelberger (77-83-MC), Marty Fleckman (82-83-MC), John Fought (80-80-MC), Rod Funseth (81-86-MC), Mark Hayes (76-83-MC), Roger Maltbie (73-92-MC), Mark McCumber (84-83-MC), Artie McNickle (76-82-MC), Steve Melnyk (80-80-MC), Jack Newton (77-85-MC), Jerry Pate (73-85-MC), Calvin Peete (79-79-MC), Don Pooley (74-84-MC), Mike Reid (79-85 -MC), Bob Shearer (86-WD), Jim Simons (80-79-MC), Tim Simpson (79-82-MC), Mike Sullivan (74-85-MC), Jim Thorpe (82-DQ), Lee Trevino (74-81 -WD), Bob Wadkins (77-85-MC) D. A. Weibring (79-82-MC), Y. Yamamoto (82-76 -MC), Kermit Zarley (80-81-MC), Lee Trevino (74-81-WD), Jim Thorpe (82-DQ). Weather: Thursday, weather was pleasant, Friday, mostly cloudy. Saturday, there were early showers and a 20-minute delay, starting at 1:08, due to lightening. Sunday, mostly sunny. Every winner is elated to have his name engraved on a tournament trophy - although sometimes his name on the big check may take precedence. David Graham expressed special pride in having his name etched on the unique Memorial Tournament trophy, a reward for his exciting one-stroke victory over Tom Watson. The transplanted Australian suggested this event born of Jack Nicklaus appeared destined to eventually attain a hallowed place in golf and its champions right with it. 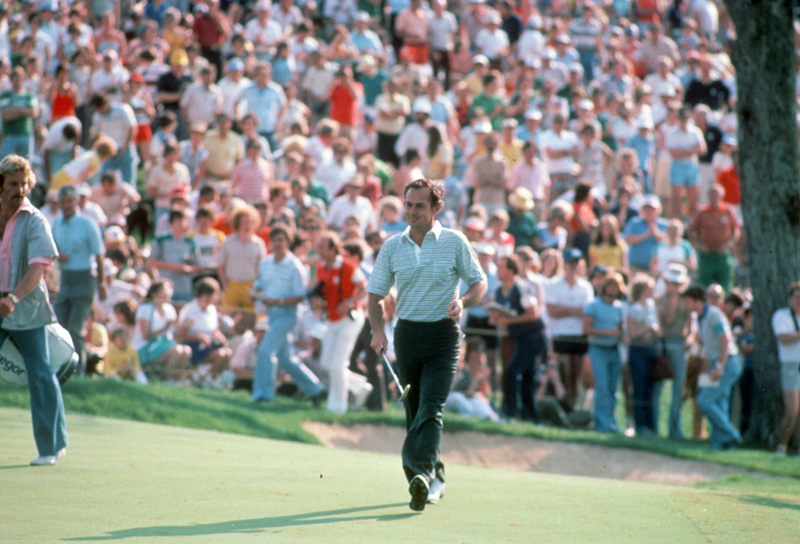 "Knowing what his (Nicklaus') situation is and knowing his name and where it's going is the history of golf," explained Graham, reigning PGA Champion and later (1981) U.S. Open winner, "I think this tournament is automatically destined to become a major championship." "It could quite possibly become THE most significant golf tournament in the world in years to come." The 34-year old Graham ranked the Memorial win with his treasured accomplishments for another reason. "This tournament means a great deal to me because of the golf course. You must drive it in position and play your irons consistently. The course requires a lot of finesse and an unbelievable amount of patience. It's gratifying to know you have the kind of game to win on a course like this." Graham, a recognized authority in club design and construction, didn't have that combination in hand when the fifth Memorial set out over the 7,116 yards of Muirfield Village torment. He struggled to a 73, six strokes behind co-leaders Bruce Lietzke and Bobby Walzel. Walzel started with a 3-under-par 33 front nine and finished at 5-under 67 . . . each tied the tournament record. Raymond Floyd was next at 68 on a day when par took its most severe beating to date: 27 pros bettered the card, 14 more matched it and eight dipped under 70. The weather was hot and clear, but the course was soft. With a light rain further abetting scoring conditions, the field took even greater liberties with Muirfield in the second round, with 31 breaking par, 15 posting 72's and 14 edging under 70. Hottest among them was Miller Barber, "Mr. X", who whipped around in 66, establishing a new tournament record. He collected eight birdies. Graham bounced into the battle with a 67 for 140, but that was still two away from co-leaders Barber, Don Pooley (69), Ed Fiori (68) and Peter Jacobsen (69). Watson matched Graham's 67 to stand at 141. Host Nicklaus was well back at 144. This happened to be Graham's 34th birthday and he shot his age on the front nine. Tournament officials presented him with a birthday cake during the press conference later. The two "finalists" moved into position in the third round, Graham with a 70 for 210 and Watson with a 69 for the same total. They still trailed Bob Gilder, who authored the best round of the day, 67 on a toughening Muirfield for 209. Actually, the leaderboard was a mob scene. John Mahaffey, Tom Weiskopf, Gil Morgan and John Fought owned the 211's and Dan Halldorson, Mike Reid, Jim Nelford, Tom Purtzer, Bill Rogers and Floyd all had 212's. Fifteen others were within five shots of the lead. In perfect weather, the chase stayed hot through the first nine holes of Sunday's final round. In fact, at one time or another, 15 different players were within a stroke of the current leader. Floyd forged ahead at 7-under, but fell back with bogeys on three of the next five holes. Barber bogies two of the first three holes and Gilder also fell back. Watson, Graham, Weiskopf, Pooley, Halldorson, Mahaffey, Reid and Scott Simpson were all at 5-under at one point. Weiskopf shared the lead with Watson after a birdie on No. 13, but bogeys on Nos. 17 and 18 thwarted his bid (72-283). Reid jumped into the scramble with birdie on No. 12, but three-putted No. 18 for a 70-282. Barber picked up a stroke to end 73-283. Coming to the stretch run, Graham was still in the chase, but galleries began to sense a second straight Watson march to the title. He was playing brilliantly, if not scoring that well, and Graham was scrambling. The Australian saved pars with bunker shots to within a foot of the cup on three front-side holes. "I was lucky," he conceded afterward. "Tom missed three putts for birdies where I had a chance to make bogey and we walked off each green with pars." Graham lost a stroke with a three-putt on No. 12, then needed up-and-down par saves on Nos. 13 and 14 to stay that close. He produced the most spectacular hole of the tournament on No. 15, parking a 1-iron within 20 feet of the pin and ramming home the putt for an eagle. Watson responded with a birdie putt to stay a stroke ahead. It became a whole new ball game on No. 17. Graham parred, but Watson three-putted to send them to No. 18 tee all even. Graham's second shot there rolled 30 feet above and right of the cup, Watson's 25 feet above the flag and on almost the same line. Graham started his putt down the incline, the ball curved slightly and dead in to the center of the cup. David did a very respectable high jump, putter held skyward. The huge gallery roared and commentators on the CBS-TV tower dug for superlatives. Quiet finally restored, Watson set putter to ball and narrowly missed the tie. "I was about 15-20 degrees off his line," Watson explained later. "David's putt was pretty much straight. I played mine to hook a little bit right, but it didn't break as much as I had planned and went a foot by. Maybe I need glasses." "I made a couple putts coming in, " Graham decided, " the one for eagle at 15 and the one for birdie at eighteen. That was the difference." Graham, an original Muirfield Village Golf Club member, broke Nicklaus' tournament record (281) with an 8-under-280 (70 final round) and Watson tied the previous mark (71-281). Nicklaus made a belated move with two birdies in the first five holes of the final round, but finished 73-288.